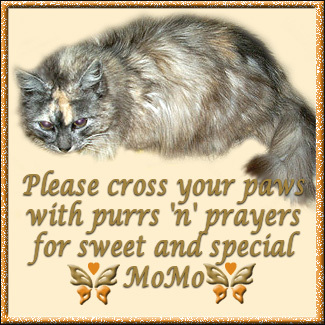 Sending tons of purrs to MoMo and her SS. Momo is having surgery on Monday morning in Australia, so by the time you read this SS may know what is wrong with sweet Momo, and if the news is not good MoMo won't be going home. We send tons of purrs to them for healing and comfort. Greeting mum as she came home from shopping. We had good reason to be happy she was home. We have a nice full container of noms again. It was getting low and we were getting worried! We don't want to starve you know. Then we got to playing and knocked over the tower. Then we could both have a sit in it.So we have had lots of fun playing this weekend. 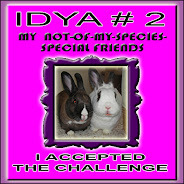 Mum wants to protest, we like blogging and using Blogger is OK. She can adapt to new things in time, but they gotta work. They shifted us to the new interface without our purrmission earlier this week. Nothing has posted right since then. Posts for certain date and time don't show up. Mum has to go in and fix it and then it works. The only thing we like so far is being able to pick all of our pictures that we want to load at the same time. Although we can't select what size we want them to go in at, small, medium or large. Nor can we see how much of our quota of picture size we have used up. So me and mum are napping here. Maybe this is just a bad dream! Nope, mum just checked. See the time? It didn't auto publish at the requested time, even under the old interface set up. Mum had to go in and re-hit the publish button from work. When she finally got time at 10:30 CDT. Hello again, it is Virginger, welcoming you to my Garden Thursday time. Our weather still has been going all over with the temperatures and a few rain showers too. More signs of spring and early coming of plants that don't bloom this early. First you can see a picture of some boy goldyfinches. Now all bright and yellow so easy to pick out at the feeders. Some rubberbarb, oh mum says rhubarb that beans can eat, amongst the snow on the mountains that spreads all along the back of the house. The pee-o-knee that is already growing so big. You can even start to see a flower bud here. One of our white lilacs that is blooming so pretty. Our purple ones don't look so good this year. When mum went for a walk along the trail, she took the flashy box with her and took a picture of the crabby apple tree from the trail. Looks good mum. We have new neighbors across and just down the street. Mum has not met them yet, they haven't been outside much. Even our next door neighbor who usually meets everyone first hasn't met them yet. Soon. It will be nice and everyone will be outside. That is all for now from the garden. Enjoy your garden! $^%&*$######, Blogger didn't publish again when it was supposed to. @#$&^%#$##. We had a good weekend, nice sunpuddles so we both took advantage of soaking up the sun in the kitch-hen windows at various times of the afternoon. No pictures but mum fired up the grill on Sunday afternoon. So we got our first grilled beast of the season. Yes it was yummy and into our tummies. We see that blogger made some changes in doing posts. So we gotta figure them out. The one we like the bestest so far is that you can select multiple pictures at the same time. Durh, the time was wrong on when to post. So this is late getting up! Thanks for checking from work mum. Hope everyone has an excellent week to come. Purrs. Hi it's me Virginger, welcome to Garden Thursday. It has been cool, cold, warmer, cooler, warmer, and soon cool if not cold again. Plus rain. Never a dull moment outside. Yep, that is me sitting and watching the front of the house, you can see the pretty pink phlox on the ground below. This started as a tiny patch and just keeps spreading. Mum likes it and says her grandmum had a huge spot in her garden many years ago. With the super warm weather we had a month ago, everything got speeded up, then slowed down. So now our flowering crab tree has opened its blooms, about a month earlier than usual. Mum sort of likes that as a lot of time if it doesn't bloom until May, she is busy running around, then she can't enjoy it as much. So she is enjoying it lots and lots this year. This is our bleeding heart plant, it doesn't have many blooms this year and parts of it look like it might have gotten nipped by Mr Frost in the past few weeks. Maybe it will be better next year. Mum says she should move it to a better spot too. So that is all for this week, enjoy your garden! A picture of us from Sunday. It was all nice and mum opened the big window that went to the floor. It was nice to smell the outside and feel the nice warm breezes. Exactly. What not share your life with our lives. We will both be better for it! HiYa, Ducky here. We had another quiet weekend. Not much happening. 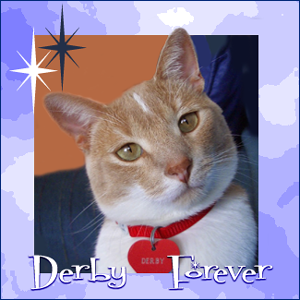 Above Derby and I are conferring on whose turn it is to be purring on mum. She is doing OK, still sleeping in the chair. I like her sleeping in the chair. Then I can go sit on her hap for the whole night! Sometimes though I have to be a bit more discreet checking up on her. So I get behind the furniture with the music boxes and peek out. She doesn't suspect, does she? It was nice this weekend. The warms were back so mum could open the windows for us during the day. Nice to get to smell the outside. Then we had boomer rains overnight too. Not bad storms, just a rain and a few booms. 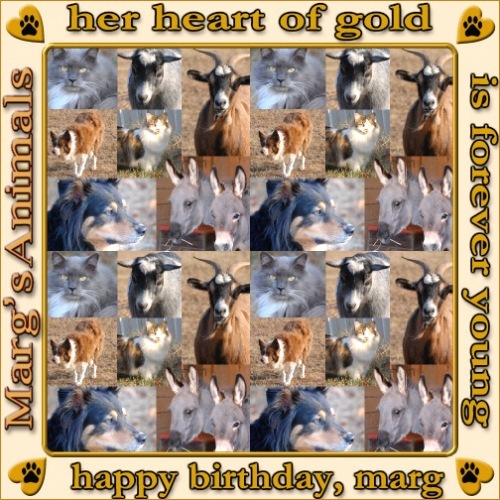 Plus Happy Purrthday to two of mum's good furiends, Miss Jane and Miss Barb. Have a happy day! Hi Virginger here, trying to keep warm. Our early and warm spring has gone and it is down right cold overnight outside. I have been snuggling inside the metal monster room at night to stay warm. Our red twigged dogwood is just barely showing its leaves. Same thing for the grape vine. Things have really slowed down after revving up so fast. Mum and I looked back at last years Garden Thursday posts. We didn't even do our first Garden Thursday post until April 21, that is when the garden guys came with the mulch. The daffy-dils were just getting opened too and we had snow flurries. On April 28 the four-cith-ia was just opening, as were the hiya-cinths. Mum said we got spoiled by the super nice weather last month. 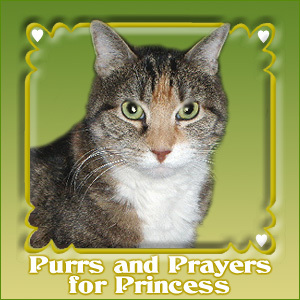 I join the boys in sending out huge healing purrs to PrancerPie and Princess. They both have sick tummies. Get better you two! That is all for now, stay warm! We had a good weekend. Mum was home almost the entire weekend. Was only gone long enough to get foods, to to the bank and library. Plus her walking time. That meant we had lots of snuggle time. Plus with it being Easter mum had her favorite, and ours, ham for Easter dinner. Yum! You betcha she shared! We had a mild tussle for who got to sit next to mum. After a bit we decided Derby could sit by mum when she is on the couch, Ducky sits on her when she is in her other chair. 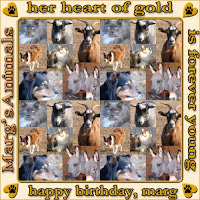 Happy Purrthday to Marg, she does so much for kitties and other animals. We hope you all had a good weekend, we did. Plus you all have a good week ahead. P. S. We now have our own Easter Bunny. Mum says it belonged to her mum. The eggs are as about as old as mum is. When she was a little wafer they colored eggs, but before they colored them they poked holes in them, blew out the insides, then did the color. So very carefully preserved for ages to come in the family. Hello, it's Virginger welcoming you to Garden Thursday. Spring has slowed down some. It got cooler, actually more normal, in terms of the temperature. So the plants haven't been racing through the season. We like that, then we have time to enjoy. It has even gotten a bit chilly some mornings, we hopes it doesn't get too cold to kill things. Some of the pee-o-knees starting to come up. The white lilac is leafing out nicely and starting to show flower buds. Close up of the crabby apple tree showing the flower buds ready to come. This is something that could get hurt by a really cold night. Ruin all the un-opened flowers. The whole tree, mum noticed a dead part that will need to get cut out. Well when she is able to do that, sometime in the future. The grass is growing and getting a bit shaggy, mum isn't allowed to push the grass eating monster around just yet. So we have a handy guy who will be coming around to take care of things for a while. Me and mum snoopervised him, he did OK, but mum thinks he is very inefficient mowing. Turning away from where he needs to go, then having to circle back around. Out front he used a huge grass eater, in one swipe it would do 4 times what mum could do with her little machine. Plus the guy rides on it! That should do for now. Stay happy and warm everyone. We weren't on line a lot over the weekend. 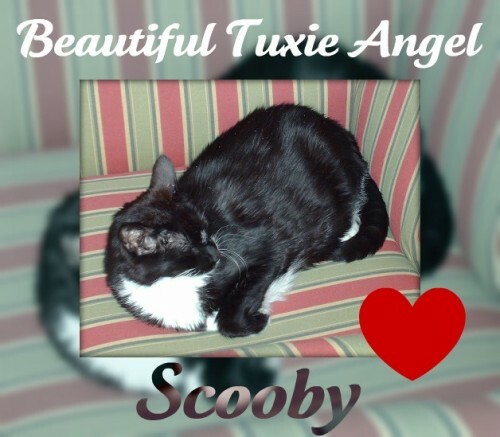 Mum didn't even check the blogs and we were so saddened to find out one of our original blogging buddies, Scooby, of Little Cat Feet, ranned off to The Bridge right in front of his mum. Dood, we will miss you lots. Our "rivalry" between Whiskerconsin and Minnysoda. Bucky Badger, Fight Sioux, your squillion, Sioux, who we sent you as part of your secret paw one year. Our eyes are leaking and our hearts are heavy. 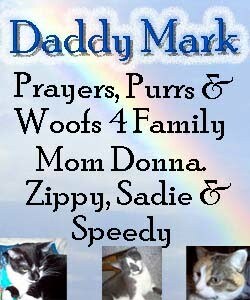 Plus over the weekend, Zippy, Sadie and Speedy lost their human Dad. He ran off to heaven on them unexpectedly. So their Daddy will be waiting for them when they run off to The Bridge. Lots of comforting purrs to you and your Mum. HiYa, Ducky here. It was a bummer weekend. The promised sun puddles didn't show up, maybe some very weak sunshine late in the day, but not enough to make sun puddles. Plus the weather guesser said it would be warmer on Sunday. Not really, at least not enough to make mum open the windows. Mum did lots of resting, reading and such. Here I am sitting on her to make her stay put and put some healing purrs on her. Derby meanwhile was resting to take a later shift. Sleeping on mum's bed, where mum isn't sleeping for now. Says she is more comfortable sleeping in the chair and she gets about the same number of hours of sleeps. Plus she was sleeping so bad she had to redo the bed everyday and that is hard as she isn't supposed to lift things. So she says it is hard to tuck in the sheets and blankies. Mum says she will be happy once Tuesday comes and go. Then the election stupidity on the moving picture box and on the calling thingy will stop. At least for a bit. She is tired of it all. She votes for "none of the above". We hopes the rest of you have a good week.